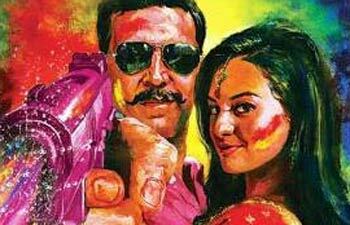 Watching Rowdy Rathore is like seeing an IPL cricket match in the stadium. It's loud, devoid of sense and proud to be so. The party starts from the very first scene/over followed by mindless fighting/bashing for the next 2.5 hours with intervention from skimpy clad cheerleaders every 15 mins. And the audience love this madness regardless of what happens in the end. But the point is, both of them sell and how? Rowdy Rathore (2012), produced by Sanjay Leela Bhansali and directed by Prabhudeva is one for the masses; tailor made for the front benchers and those within 15 rows behind them. And why wouldn't they love it? Akshay Kumar oozes with charm and confidence in a double role, both of which sit right in the middle of his comfort-zone. He is very convincing in both action and comedy scenes and pulls off the entire movie almost by himself. The movie works because for once, Akshay hasn't overdone himself (as in his previous 8-10 outings). Cast as Shiva and Vikram Rathore, he reprises a charm that I think he lost after playing Sunny in Mujhse Shaadi Karoge. He is supported well by Paresh Ganatra (cast as 2G), his sidekick. Between the two, they share plenty of healthy humor that isn't cheap without getting cheap making the first half very entertaining. Also, watch out for cameos from Kareena Kapoor, Vijay and Prabhudeva himself. The plot, which is clearly 15 songs too much and 15 yrs too old is the movie's real set back. With so many holes, the script can give a serious complex to a standard fishing net. The story is cliched; even in the non-hole areas. Half the story unfolds in Mumbai and the other half in a Patna version of Sholay's Ramgarh (called Devgarh in Rowdy). An honest police officer comes to a village run by the local goon; goes through the usual stuff. He is separated from his super-cute little daughter; who in Mumbai finds a baap-ka-hamshakal. Akshay is in double role and you can predict the rest. Oh yea, somewhere in between all this mess is Sonakshi Sinha (as Paro), with the only task of showing off her kamar at every opportunity. All in all, the movie is loud, stupid, full of gore and celebrates it. Enjoyable, only for the Akshay-Rowdy-Kumar who can act, fight and makes us laugh; all in the same movie. Add to this the Dont-Angry-Me attitude, he delivers a performance that is a tad better than Salman-Dabangg-Khan. Watch this movie if you want to experience that guilty pleasure of having indulged in something below your standards. Nothing more. I loved the movie.....and while reading your review i saw the movie again.....will read it once again...wait!!!! !